Nathan MacKinnon has been absolutely shredding up the NHL this season. As one of the main elements in what has been an impressive bounce back season for the Colorado Avalanche, MacKinnon has steamrolled opponents on his way to 81 points, tying him for third in the NHL scoring race (Nikita Kucherov has 88 points, but has played in seven more games MacKinnon, and Malkin has 85 points, but has played in five more games than MacKinnon). He leads the league in points-per-game (1.35) and seems to put up multi-point games almost every time he’s on the ice. If he’s able to maintain this pace, or even close to it, for the rest of his career, MacKinnon will surely be inducted into the hockey hall of fame sooner than later. To prove that point just a little bit further, he’s joined a pretty nice group of hall of famers (with the exception of one) with his assist on Tyson Barrie’s first period goal. MacKinnon became the 6th youngest player in Nordiques/Avs’ history to score 80 points. While 6th on a franchise record list may not sound all that glamourous, it does once you take a look at the other names on the list. Joe Sakic and Mats Sundin were two of the most legendary players during the 1900’s and early 2000’s. On top of that, Nordiques’ great Michel Goulet found his way into the hall of fame as well, leaving just Anton Stastny off the list of hall of famers. In a franchise that has seen so many phenomenal players pass through it, MacKinnon making this list is a testament to how much excitement and success he has brought to Denver this season. That’s not the only list that MacKinnon has made recently though. 59 points at home for Nathan MacKinnon in 32 games. This is absurd. Even if he didn't play a single road game, he'd still be ranked 40th in the NHL in points. Good lord. 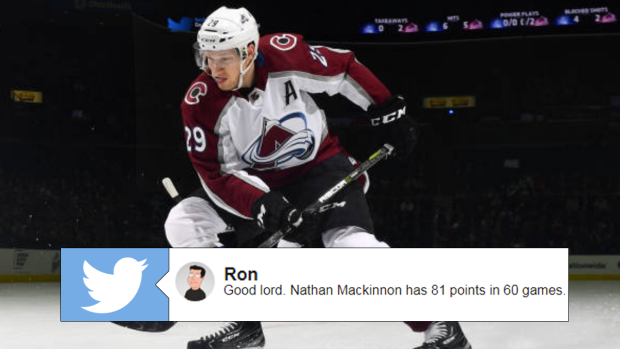 Nathan Mackinnon has 81 points in 60 games. Six game point streak for Barrie. Eight game point streak for MacKinnon.